The biodegradation of fish scale residues is an alternative method to convert crude proteins into bioproducts of industrial interest. In view of this panorama, the objective of this study was to evaluate the use of tilapia scales as a supplement for the growth of Bacillus subtilis. For this, the work was divided into two stages. In stage 1, degradation assays with Bacillus isolates (B1, B2, and B3) were carried out in minimal mineral medium (MMM), supplemented with 1 g of fish scales, to which 1 mL of inoculum (108 UFC mL-1) was added. The culture was incubated for six days at 125 rpm and 37 °C, and the pH was measured at the end of the degradation. In stage 2, two scale-based culture media (broths C1 and C2) were formulated. The efficiency of the formulated media was determined by the specific growth rate μ (h-1) and the doubling time td (h) of B. subtilis (B1). Isolate B1 presented with the highest degradation yield from the treatment with the crushed scales and with a higher increase in the pH value (7.8) in the medium. In broth C1, the B. subtilis microorganism (B1) had a higher specific growth rate (1.9363 h-1) and a shorter replication time (21.5 min). Therefore, different species of Bacillus were able to degrade the tilapia scales, and this product was found to be efficient in the formulation of culture media. This work demonstrates the application of novel technologies for the use of agroindustrial residues from the fish industry, resulting in a financial gain for the industry itself. The production of keratinase can generally be performed in relatively inexpensive growth media that contain keratinous substrates as the major sources of carbon and nitrogen; this makes the production of this enzyme highly favorable from an economic point of view.8 Therefore, it can be inferred that the bioconversion of fish scales is performed by keratinolytic microorganisms. Although certain studies have previously reported the use of residues as substrates for microorganisms, ours is the first report on the use of fish scales by Bacillus species. The results of this study demonstrate that the use of bioproducts in culture media is rather promising when taking into account the microbial growth under the tested conditions. In research laboratories, culture media are commonly used to supplement the nutritional requirements of microbial cells. However, the expenses related to these media can greatly burden the laboratory activities. Therefore, the interest in inexpensive formulations, aimed at the use of residues, has grown over time, in order to achieve environmental preservation and a favorable cost-benefit ratio. Against this panorama, the objective of the present study was to analyze the efficiency of the biodegradation of Nile tilapia (Oreochromis niloticus) scales for their use as a substrate for the growth of a Bacillus species, with an aim for substitution in the formulations of high-cost culture media. The isolates (B1, B2, and B3) were cultured via submerged fermentation in whole scales broth (WSB) and crushed scales broth (CSB). The broth media contained (g.L-1): 0.05 MgSO4.7H2O, 0.005 ZnSO4.7H2O, 0.015 FeSO4.7H2O, 0.025 CaCl2, 10 glucose, 10 yeast extract, and 17 whole or crushed scales. The initial pH of the broths was adjusted to 6.5 before sterilization at 121 °C for 20 min. Erlenmeyer flasks (250 mL) with 60 mL of WSB or CSB were inoculated with 1 mL of a bacterial suspension solution (108 CFU.mL-1) and incubated at 37 °C and 125 rpm for six days. At the end of the sixth day of degradation, the pH values of the media were measured. Negative (no microorganism) and positive (no scale) controls were incubated under the same conditions. To determine the growth kinetics, the bacteria were then subjected to culture in formulated and commercial media. The culture media formulations were as follows: broth C1 (5 g of crushed scales, 5 g glucose, 1.5 g yeast extract, 5 g sodium chloride, and 1 L distilled water, autoclaved at 121 °C for 15 min), and broth C2 (hydrolysate from the previous degradation of 1 g of crushed scales by the selected microorganism, sterilized by filtration). The concentration of the scales was based on the composition of the commercial medium (nutrient broth) (HiMedia, Mumbai, India), aiming at the replacement of the animal peptone with the fish scales. The performance of the microorganism in the formulated and commercial media was evaluated by the construction of growth curves. Erlenmeyer flasks (500 mL) containing 180 mL of nutrient broth [0.5% peptone, 0.5% sodium chloride, 0.15% meat extract, and 0.15% yeast extract] or 180 mL of the formulated media were inoculated with 1 mL of the standardized microorganism (108 CFU.mL-1) and incubated at 35 ± 0.5 °C at 125 rpm. At intervals of 0, 1, 2, 3, 6, 12, 24, and 48 h, a 100 μL culture aliquot was diluted to 10–5 in an Eppendorf tube containing 900 μL of an 0.85% saline solution. Then, 20 μL of each dilution was inoculated in triplicate on a Petri dish containing Plate Count Agar (PCA) medium (HiMedia, Mumbai, India) and incubated at 35 ± 0.5 °C for 24–48 h.
The growth kinetics of the selected microorganism were used to verify the efficiency of the culture medium (broth C1 or C2) compared to the control medium (nutrient broth). The specific growth rate μ (h–1) and the time of duplication td (h) of the bacteria were obtained from the growth curves, which were generated by measuring the number of viable cells (CFU.mL-1) as a function of time (h). The degradation yield obtained from the whole scales broth (WSB) for the isolates of the genus Bacillus ranged from 15% to 21%. Whereas, the degradation yield from the crushed scales broth (CSB) was higher, ranging from 22% to 26%. Isolate B3 demonstrated the highest yield for whole scale degradation, and it differed statistically from the others. When ground scales were used, isolate B1 demonstrated the highest yield at 26% (Table 1). Table 1. Yield and pH for the degradation of the tilapia scales by the bacteria of the genus Bacillus. The values followed by the same lowercase letter in each column and the same capital letter in a row do not differ statistically, according to Tukey’s test (p≤0.05). The experimental yield data were adjusted in cos x–1. The use of fish scales in the formulation of a culture medium is possible, considering the efficiency of the development of Bacillus subtilis [(Ehrenberg, 1835) Cohn, 1872] in the media that contained the scales compared to the commercial culture medium (nutrient broth). Cell growth of 109 CFU.mL-1 was achieved for both culture media, and this differed statistically from the growth observed in the nutrient broth (Table 2); this may have occurred because glucose was only present in the formulated media. Table 2. Maximum growth of Bacillus subtilis in the formulated media and nutrient broth. The values followed by the same letter do not differ statistically by Tukey’s test (p≤0.05). The experimental data were adjusted for log. The compositions of broth C1 and the nutrient broth differed by only two ingredients. In broth C1, peptone was replaced with the crushed scales, and the meat extract was replaced with glucose, as an alternative, to provide an initial carbon source for the microorganism, in order to support microbial degradation. Figure 1 depicts the growth curves obtained for the B. subtilis cultures in the three culture media tested (C1, C2, and nutrient broth). In broth C2, the duration of the exponential growth phase was longer than that observed for broth C1. However, broth C2 exhibited the characteristic curve for bacterial growth with well-defined phases (Fig. 1). Figure 1. Growth curves for the cultivation of Bacillus subtilis in the fish scale broth (C1 broth), hydrolyzed protein fish broth (C2 broth), and commercial nutrient broth. Table 3. The growth kinetics of B. subtilis in the three different culture media. Table 3 shows the results obtained in relation to the microbial growth of B. subtilis, which include the growth rate, the analysis of variance, doubling time, and the duration of the lag phase in each of the media tested. 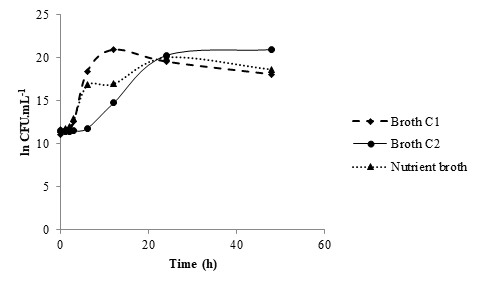 In broth C1, B. subtilis exhibited a higher growth rate and a shorter doubling time, when compared to C2 and the nutrient broth. Among the media tested, broth C2 was the medium in which B. subtilis duplicated most slowly. After the observed diauxic growth in the nutrient broth, the growth rate of the microorganism decreased, as shown in Figure 1. The growth of B. subtilis in the fish stock broth (broth C1) caused an abrupt decrease in the instantaneous growth rate, after the exponential phase had transitioned to the stationary phase. Meanwhile, in the hydrolyzed protein broth (C2 broth), this transition was gradual; this difference may be explained by the depletion of glucose that occurred in broth C1. The variation observed between the growth profiles for the C1 and C2 broths could be related to the composition of the media. In the C2 broth, the source of carbon and energy was basically the hydrolyzed keratin and collagen compounds; whereas, in broth C1, in addition to glucose, the yeast extract, NaCl, and 0.5% of crushed scales were available. The media formulated with scales fulfilled the nutritional requirements of B. subtilis, as the scales are composed of organic molecules that can act as a source of carbon, nitrogen, and energy. In view of this panorama, the utilization of fish scale residues by microorganisms and their subsequent application in the industrial sector appears rather promising. However, it is necessary to perform tests capable of determining the proteolytic activity and to optimize the degradation process, as well as to evaluate the viability of the formulations. This study showed that a new Bacillus subtilis (B1), isolated from fish scales, showed the capacity to degrade recalcitrant substrates in submerged cultures. Therefore, the same could be used in the bioconversion of tilapia scales by means of fermentation, in order to reduce the amount of industrial solid waste, which makes it possible to use them in the formulation of culture media to replace the commercial means available on the market. Additional studies are needed to quantify the activity of the enzymes involved in the degradation process, as well as to optimize the production process for future biotechnological applications. The authors gratefully acknowledge the financial support of the Conselho Nacional de Desenvolvimento Cientifico e Tecnológico (CNPq) and Programa Nacional de Pós Doutorado (PNPD/CAPES). Jéssica Ferreira Mafra: Substantial contributions to conception and design, or acquisition of data, or analysis and interpretation of data. Paulo Sérgio Pedroso Costa Júnior: Substantial contributions to conception and design, or acquisition of data, or analysis and interpretation of data. Thiago Alves Santos de Oliveira: Substantial contributions to conception and design, or acquisition of data, or analysis and interpretation of data. Elizabeth Amélia Alves Duarte: Substantial contributions to conception and design, or acquisition of data, or analysis and interpretation of data. Involvement in drafting the manuscript or revising it critically for important intellectual content. Aline Simões da Rocha Bispo: Involvement in drafting the manuscript or revising it critically for important intellectual content. Norma Suely Evangelista-Barreto: Substantial contributions to conception and design, or acquisition of data, or analysis and interpretation of data. Involvement in drafting the manuscript or revising it critically for important intellectual content. Silva ND, Junqueira VCA, Silveira NFA, Taniwaki MH, Santos RFS, Gomes RAR, Okazaki MM. Manual de métodos de análise microbiológica de alimentos. 3 ed. São Paulo: Varela, 2010. Reginato E, Teixeira ML. Avaliação do potencial biotecnológico de bactérias do gênero Bacillus na degradação de resíduos de pele suína na indústria alimentícia. Rev Bras Prod Agroind. 2009; 11: 81–86.